a. poor financial condition: When a girl is poor/middle class, she’s seen in kassi hui choti or sometimes dheeli choti and ghise pite clothes with no makeup on and no jewellery but when her family becomes rich/ upper middle class, she leaves her hair untied (if it adds beauty to her) and becomes so classy that we can’t tell if she’s the same gandi mandi bachi! Recent example would be of Mann Mayal’s Biya. I mean, c’mon! How much does it take to look stylish after all? Why do they portray fashion and style to be limited to wealthy people only? I don’t think it takes much time to remove your elastic band and leave your hair untied or much money to buy some bobby pins and hair elastics to do some cute hairstyles. Or to buy some jewellery on a monthly basis or buy some beautiful dresses. Fashion sense pata nhin kahan chali jati he warna I don’t think a good fashion sense has anything to do with financial status or wealth. Also, a poor boy is seen wearing ghissi piti kameez shalwar and a rich boy wears three piece suit. b. good character of a girl: Fashion and goodness of character aren’t two opposite things, when will drama makers realize this? In Maat, where Aiman was a good girl with so many qualities and Saman was selfish, Aiman was shown wearing dheeli choti and safaid dupatta and Saman was shown fond of fashion, beautiful clothes, makeup. 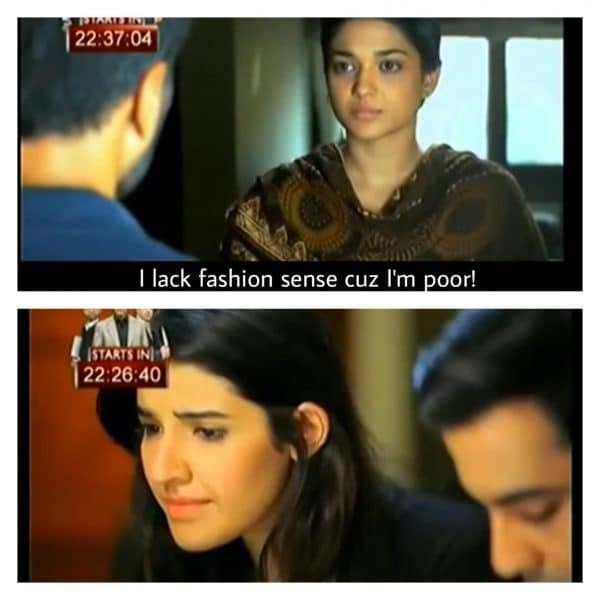 I haven’t watched Mere Mehrban except its first episode but I think in that drama too nice sisters were seedhi sadi in terms of fashion and negative characters were wearing tons of makeup! Recent example will be of Zara Yaad Kar’s Mahnoor and Uzma. Again I will say, a good fashion sense and being fond of good clothes, makeup and jewellery has nothing to do with a person’s character. Character is something we can’t judge by looking at a person, his tidiness and style is. Why look gandi mandi all the time just to look innocent and religious when even religion doesn’t teach this? Allah is beautiful and loves beauty. Cleanliness is half the faith – this is something we and drama makers need to understand. c. a girl’s marital status: Yes and I mean it! If an unmarried girl wears no makeup & jewellery, once she gets married, makeup, untied hair, jewellery will be the things she’ll be seen wearing. There are many examples, in fact it won’t be wrong if I say that it happens in literally EVERY Pakistani drama!!! 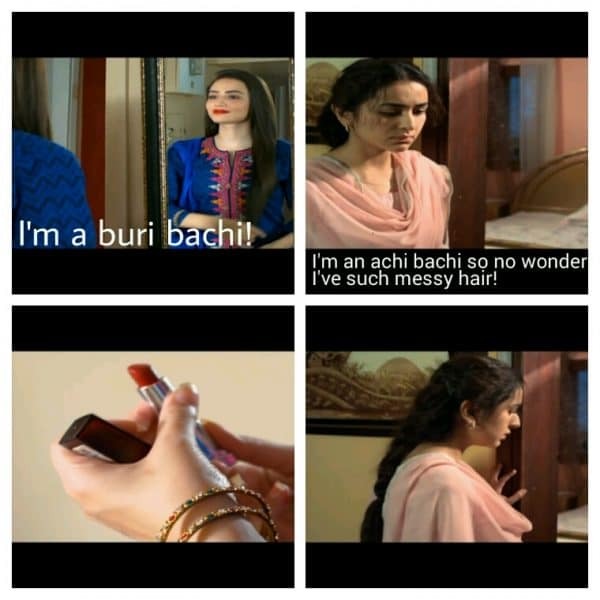 In this regard, Udaari is a breath of fresh air where Miran doesn’t mind being stylish. 2. Hijab is also inversely related to financial and marital statuses: I mean WHAT has getting married to do with leaving good and in this case a compulsory thing? No offense meant to non hijabis but in this case I’m talking about characters who wear hijab either before getting married or before getting rich. 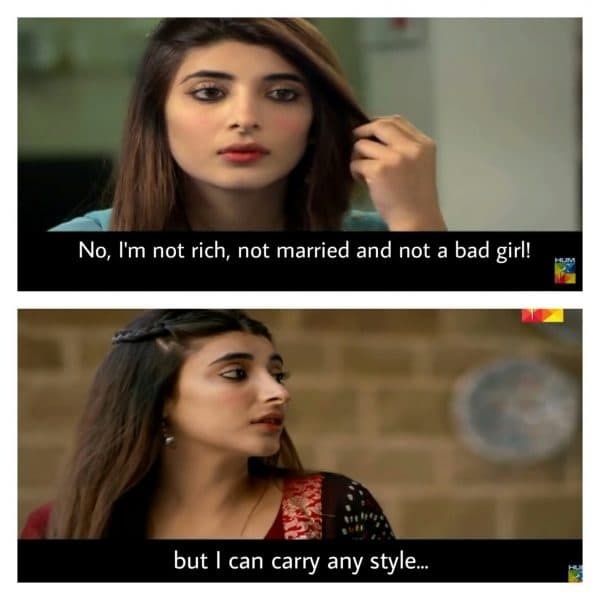 This is the most common trend of Pakistani dramas that level of hijab diminishes as one gets richer or gets married and I’m quite annoyed with drama makers for showing this Weirdest thing! I don’t think a hijabi girl will leave her hijab ever when she’s used to it just for the sake of her husband. 3. A woman avoids flirting only when she’s married: I can’t call it a trend because I can’t remember any drama other than Mein Sitara in which this concept was present but I thought I need talking about it. “Mein kisi aur ki hun, mujhe Allah ka dar khof he!” Whether you’re married or single, flirting is haram! It’s not that you should only fear Allah when you’re married, you should also fear Allah when you’re single and someone is persuading you to have a haram relationship (chatting, meeting and talking without the presence of a third one). In Mein Sitara when she was repelling Farhad by saying, “mein kisi ki biwi hun, musalman hun, Allah ka khof he mujhe, hudood nhin tor sakti” type of things I was thinking that before her marriage she was ready to meet Farhad in his office and it was and remained haram before and after marriage so drama writers should not mess it up by bringing marriage in this issue and should not confuse young people. 4. 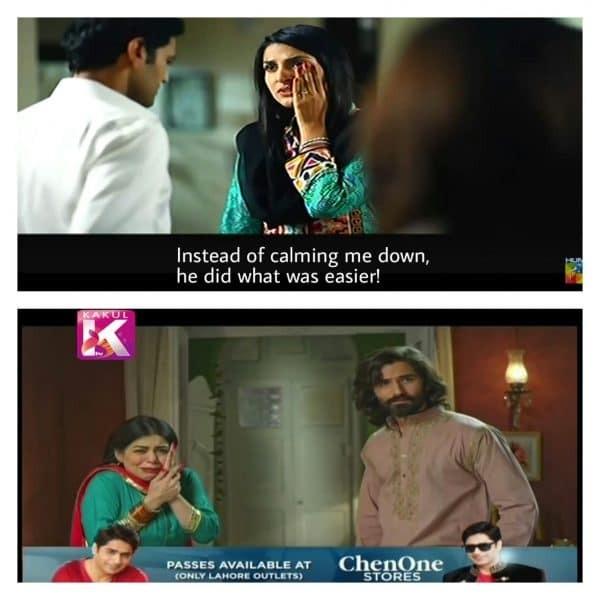 A Pakistani woman can’t express her anger over anything, if she tries to, she’s slapped: It is the most sad part of Pakistani dramas that they show hitting wife as a normal thing. ?I don’t know what do the writers have in mind or what do those characters have in mind, that for shutting their wives up they simply slap them! Wife na hui, punching bag hui!! It is totally against moral and religious values where our religion teaches us not to harm your wife, do not hit her face, do not hit her in a manner which might leave scars, the drama makers are showing the exact opposite. In Dil Lagi when Sabiha was angry over Fazal and bad-mouthed his sisters, he was not capable of handling the situation by bringing his wife and sisters closer rather what he could do and which showed how unmanly he was, was slapping his wife!! In Main Dewani, when Farnaz was suspicious of her husband and niece having an affair and as a result when she yelled at her husband, what he could do was to slap her! I can write many and many more examples of domestic violence where husbands can’t handle strong wives or wives who are upset or angry or are having problems with their husbands or in laws but I think it’s enough! When drama makers will show us such stupid things, our society will gradually accept and adopt such things as something normal which should not happen as any normal person will dislike domestic violence and it is also against our religious teachings. Share what you find inappropriate in our dramas.